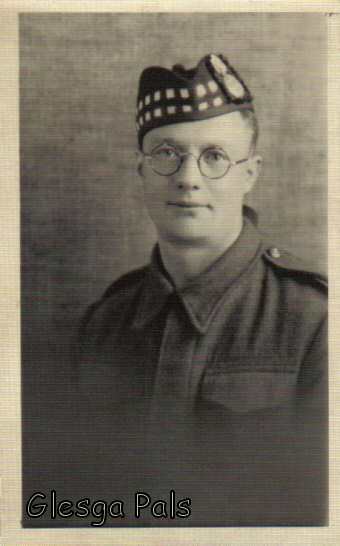 On the outbreak of War William joined the 8th Battalion, Highland Light Infantry. He was sent to the Western Front and was on the front‐line at Givenchy in the summer of 1915. William Angus, the son of a coalminer, was born in Linlithgow on 28 Feb.1888. He left school at the age of 14 to work in a coal mine in Lanarkshire. While playing amateur football for Carluke Rovers, in 1911 he signed professional terms with Celtic but failed to become a regular member of the first team. He played with Celtic FC during seasons 1912-13 and 1913-14, then in 1914 he signed for Wisham Athletic. After his return from the war, he was often invited to major football matches as guest of honour. He became President of Carluke Rovers FC, and retained that position until his death. Germany with the Royal Scots Fusiliers. Hi Webmaister.It's a small world. Just noticed your Uncle William in RSF. Reminded me right away of this one of my Dad William Hay also in them, when he got called up in 1939. I only saw him two or three times between then and 1945 or 46 when he came back from Germany and straight into civvy street. Nae counselling then! 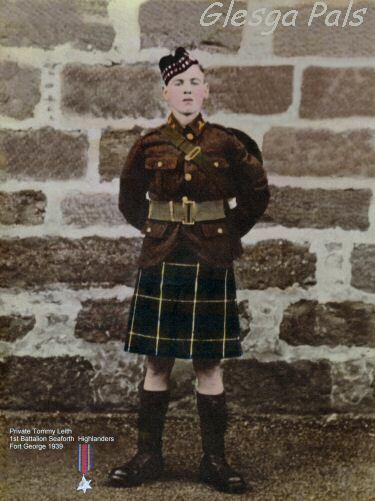 Always remember once we were at Dunoon on holiday (about 1940/41) and he got some leave, came up from Catterick and off the ferry complete with 'tin hat', rifle, kit bag and a big bag of coal. God knows how he carried it all but we got a rerr heat for the rest of a very typical Glesga Fair Fortnight doon the watter. AFTER 373 years of pride, sacrifice and service, The Royal Scots - the oldest regiment in the British Army - marked its passing yesterday with an emotional march through Edinburgh. Large crowds ignored the drizzle to pay tribute to the regiment's proud history while also hailing a new future as a battalion. The Royal Scots will merge later this year with the King's Own Scottish Borderers to form The Royal Scots Borderers, 1st Battalion The Royal Regiment of Scotland. The parade also celebrated the return of active servicemen from an operational tour in some of Iraq's most dangerous hotspots. Some 400 troops dressed in desert combats, bayonets fixed and drums beating, joined 200 veterans who had travelled from all corners of the country to take part in the farewell ceremony. The Princess Royal, the Colonel-in-Chief, took the salute from the steps of the Royal Scottish Academy, watching the procession marching with colours flying down Princes Street. The parade included the Territorial Army and cadets, as well as affiliated regiments such as the Canadian Scottish and Royal Newfoundland Regiments and the Royal Gurkha Rifles. Leading the veterans' Old and Bold march, Lieutenant-General Sir Robert Richardson, the regiment's former colonel, said the "golden thread" linking the past and more than three centuries of "unrivalled tradition, service and comradeship, courage and loyalty to crown and country" will be preserved through to the future. "The Jock is second to none and admired throughout the world. One request to my old comrades and those serving today: treasure the past, draw strength from it but do not live in it. The old days are gone, never to return. Embrace the future," the general said. But despite Sir Robert's encouraging words, a sense of regret and nostalgia dominated the ceremony, as active and retired servicemen felt that centuries of proud traditions and loyal comradeship were being lost forever as The Royal Scots ceased to be an independent regiment. The Royal Scots, the oldest Regiment of the Line, was formed in 1633 when Sir John Hepburn, under a Royal Warrant given by King Charles I, raised a body of men in Scotland for service in France. Nicknamed Pontius Pilate's Bodyguard after an argument with the French Regiment of Picardie over who would have guarded Christ's tomb best, The Royal Scots were posted to Tangiers in North Africa, where they won their first Battle Honour. On the regiment's return four years later, the title "The Royal Regiment of Foot" was conferred by Charles II. Battalions of The Royal Scots have been involved in almost every campaign in which the British Army has fought, from Marlborough's battles in the Napoleonic Wars to the Crimea and South Africa. During the Great War more than 11,000 were killed and more than 40,000 wounded. After 1945 the regiment continued to serve in many parts of the world, including Germany, Korea, Cyprus, Suez, Aden and Northern Ireland and in 1983 it celebrated 350 years of history, with the Princess Royal being appointed Colonel-in-Chief. The major defence shake-up which created the Scottish super-regiment was billed by the UK government as a move to modernise Britain's armed forces, but many in the crowd yesterday denounced it as a penny-pinching bonfire of tradition. 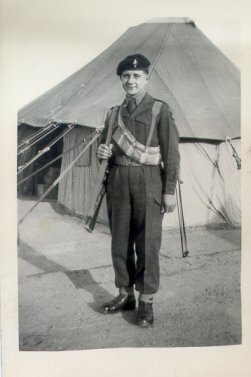 Major Steve Simson, who joined The Royal Scots in 1948 at the same time as General Richardson, said he and the unit's former colonel exemplified the deep bonds and sense of family that had been forged within the regiment throughout the years. 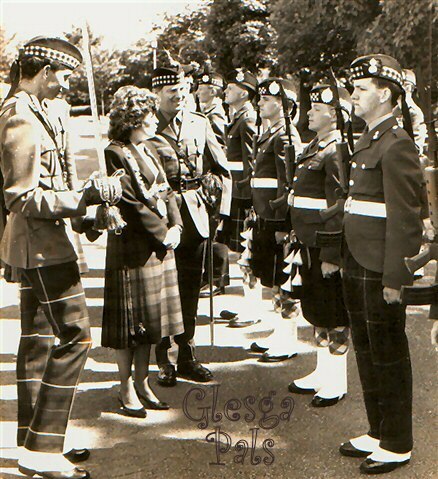 Like Major Simson and General Richardson, Danny Malloy and Bill Scally travelled to Edinburgh to meet their comrades and bid farewell to their regiment. Dressed in the battalion's tartan, Mr Scally, 84, a Normandy veteran, did not march with his comrades but watched the parade as it proceeded from East Market Street to King's Stables Road, where it disbanded. "I couldn't stay at home. This day was far too special," he said. Mr Malloy, from West Calder, in Midlothian, said: "It's a very sad day today," as tears rolled down his cheeks. James Jack, 92, the regiment's oldest member, refused to stay at home, braving the rain in his wheelchair. But his determination to meet his comrades was rewarded when the Princess Royal stopped to talk to him. 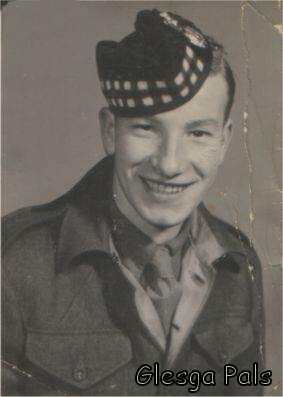 The member of the Second Battalion, who had been captured by the Japanese, said: "The Royal Scots was a great regiment and I met some very fine men during my service." Norman Soutar, a former Royal Scot who served in the first Gulf war, said marching along Princes Street with the regiment for the last time was "a very sad moment". ( known as Sonny ), served with the R.E.M.E. (Royal electrical mechanical engineers ) in Egypt. This picture was taken in August 1954. 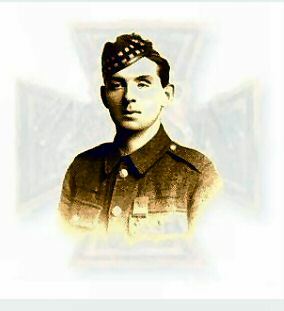 Tommy was born at 7 Summer St. Bridgeton on 13 January 1922. Son of Robert and Annie Leith. GlescaPal Bonny's son Tommy was best pals with Paul when they were young, and he was always one of the family. Paul now lives in England with wife Melanie and daughter's Daisy and Lilly.